Can you believe it? Yet another month in the life of the KawaiiPunk Blog has come to an end! But that doesn’t mean we have to forget it! Remember how we saw a kawaiified spring, the Sleepy Mascot being congratulated, and the Frost Mascot getting even cooler? And what about the designers and crafters we met? Heavyhand, Sleepy Robot 13, and Lucia Salemi to name a few! And what about our monthly puzzle? 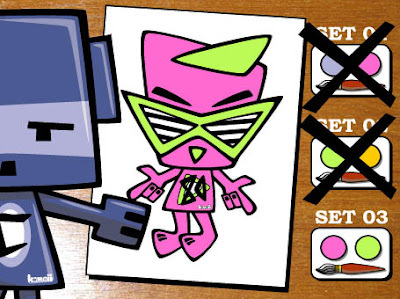 Did you work which paint set the Cubist Mascot should pick? Amazing! It was set number 3 - the garishly bright green and pink set! Well, he was painting the Eighties Mascot after all! And you can’t really expect anything sensible to have emerged from the 1980s, can you? I mean, just look at some of the hairstyles that were knocking around! Anyway folks, that’s all for this month, but be sure to come back next month when we’ll have plenty more kawaii goodies for all of you to enjoy!